One of the key factors that separate winning sports bettors from the losers is a proper mindset. To be successful at sports betting, you need to keep your emotions in check, following a proven plan, and understand that you will not win every game. Nobody likes to lose, especially money but any investment does have risk. By following these five simple tips, you can minimize your risk and possible make your sports betting more profitable. The top sports handicappers have developed their own methods for deciding on which team to wager, if they wager at all. You’ll want to develop a system of your own. Your system will not only remove the emotional aspects of sports betting but provide a logical and proven platform for your sports investment decisions. The goal, obviously, is to pick more winners than losers and having your own system is the first step to successful sports betting. Why are you sports betting? Do you just want to throw a few dollars on your favorite team to make watching the game more exciting? Well, that’s great! Go ahead, spend your money, and enjoy the game, good luck. You don’t need to read anymore… we’re done. If you’re like me, you placing sports bets to make money – and lot’s of it. Sports betting is an investment that can be analyzed, reasoned, and the outcome predicted as easily as predicting the future return for any stock market investment. Your decisions need to be based on logic, well researched information, and on a system that has proven results. You don’t let emotion into the equation; your decisions are based on logic. You don’t make last minute decisions to wager just because it caught your attention or you overheard it in the sports book. You do your homework before you wager dollar one. If you’re not sure about any wager – pass. It’s not like there won’t be more action later in the day or even the next day. Your goal is to consistently pick more winners than losers – thus, making you the money. Like any investment portfolio, you will need starting capital (your bankroll) and stop losses for your investment. Make sure you are properly funded and not risking money to you will need to cover your expenses. You wouldn’t risk money day trading that you need to pay bills like car payments or mortgage – so don’t do it sports betting. Don’t even think about it. One of the first rules of operation for any business is to create a budget. Sports betting is no different. To be a successful sports bettor, you need to develop a budget and stick to it. Cash flow or money management is the single most important aspect of winning sports bets. Never bet more than you can afford. Determine your budget and separate that money from the rest of your money – it’s now devoted to sports betting just as if you were funding a business. Once you have determined your budget, determine how much you can wager on a single event or day. This amount will usually be 1-2% of your total bankroll. This limit is purposely set low to be able to ride the ups and downs of winning and losing that naturally occur with any investment risk. Just like stock picks, not every sports bet is going to be a winner. Be strict and follow your budget limitations. To be successful, you need to look at the big picture. Baseball season lasts over six months and you don’t want to lose your entire bankroll by May with nothing left for the remaining season. If you can stick to your plan (and with a little luck) you will find that your bankroll has grown over the season. You lost! Now what? Face it, you are going to lose for no explainable reason – it will happen. One of the biggest factors that separate the winners from the losers is what they do after losing a bet. Smart bettors know that it wasn’t personal – you need to think the same way and move on with your life. If you let your emotions get into your decision making – this isn’t for you. Do something else. If you’ve given yourself a budget and you’ve stuck to it – great! You have plenty of money left in your bankroll and this will not impact you in the long run. One of the worst things you can do is to try and win back loses after a bad beat. This is called “chasing” and it is one of the quickest ways to lose your bankroll. When you are chasing your bets, you’ve let your business plan fly out the window and you’re making your decisions on emotion. No investment is guaranteed to return a profit, but you can minimize your risk. You will never lose money you don’t wager! When you risk money – it creates stress. You’re stressed because you are fond of your money and don’t want anything to happen to it. That’s natural. One of the best ways to minimize this stress is to develop a plan. Just like a business, you need to develop a plan that will instruct you on what to for every scenario you are faced with. Things like sticking to your own handicapping system and not letting others tell you what to bet on, having a solid money management plan that you can STICK TO, and contingencies for other challenges that you think you face during your sports season. With these basic business fundamentals in place, you can remove emotion and stress from your decision making process. Remaining calm and relaxed will let you concentrate on the fundamentals of sports handicapping and eliminate you from doing the wrong things for the wrong reasons. There you have it. By treating sports handicapping like a business, developing a solid plan of attack, and developing the proper “mindset,” you can minimize the distractions and poor choices that you previously made and concentrate on picking winners just like the pros. 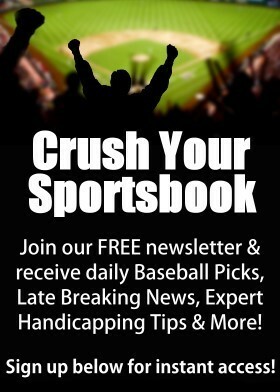 If you’re serious about sports betting, we recommend you check out our Las Vegas Sports Insider MLB service. We provide professional MLB handicapping and baseball predictions based on a foundation of Performance, Price, and Value . We value your belief in us and hope that you will join us for another winning season. If you have any questions please do not hesitate to contact us and if you want to subscribe – we look forward to working with you. Together we can be a success. Is Handicapping Baseball a Waste of Time?